grow business online & offline. As for effective marketing videos, you can have different fonts to bring words to life. With Animiz, there provides distinctive fonts examples for you, select or drag one of the textboxes you can quickly add text to the canvas. You will make your common text information perfectly presented if you customize its shadow (fill color, shadow distance, shadow angle, inner shadow), WordArt, opacity and colors. Distinctive fonts is a smart way to make your animated video presentations more professional and attractive. Compelling text provided can tell loud and hook audiences. Well-designed marketing videos will feel like a movie-style when added subtitle. In this case, when audiences see the animated video and read the descriptive statement at the same time, they will be better understand your ideas, and remember your contents deeply in mind. 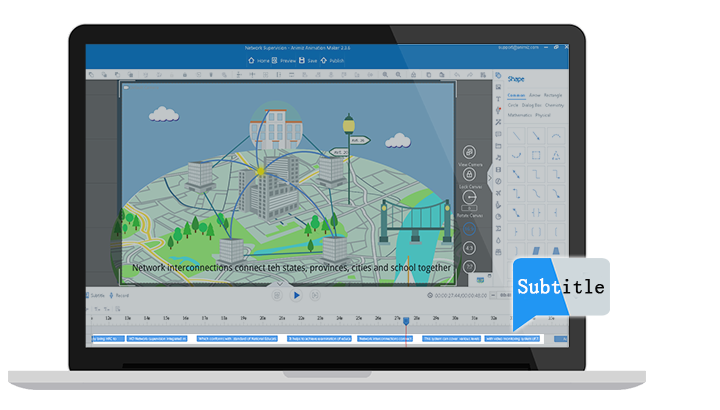 Animiz animated marketing video creator, inspires you to add subtitles and fully editing these subtitles with suitable fonts, size, colors, background and position. Video subtitle are playing meaningful role in video marketing, because it results in greater depth of processing by focusing attention. 300+ lively animation effects offered by Animiz animated marketing video creator you can utilize to decorate video contents. Among which, move animation is a gorgeous emphasis effect to showcase marketing ideas and brand stories. Click and choose "Move" animation, then you can add nodes and drag them to give objects visual motion curves. You will make every object to move in stylish way, enhancing engaging viewing for your animated marketing videos. Use layers adjustment to change sequence of different objects. As you have added too much objects in canvas, Animiz simple interface enables you to edit their layers for better video enjoyment. Just select objects, click to Send to Bottom, Bring to Top, Send Backward, Bring Forward buttons to manage their presenting orders, which will be helpful for designing intuitive marketing videos. 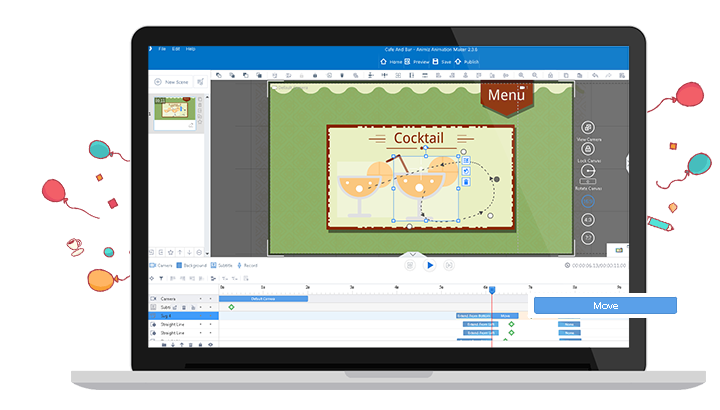 Download Animiz video creator freely online and open the software to start creating marketing videos. Distinctive font examples offered to bring words to life. Add to canvas and make them your style. Video subtitle results in greater depth of processing by focusing attention. Perfect for video marketing. 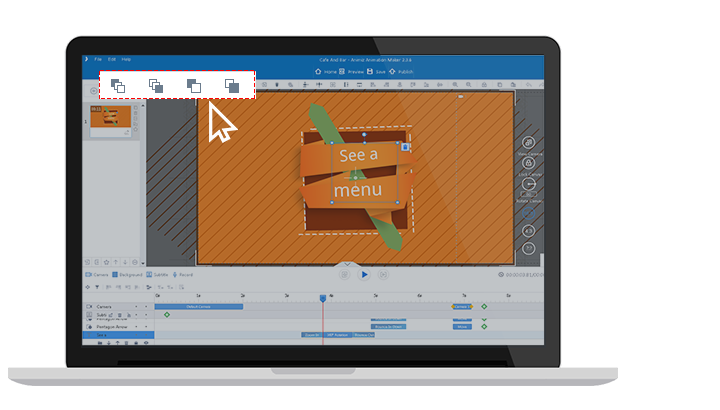 300+ lively animation effects provided by Animiz to decorate video contents with great visual. 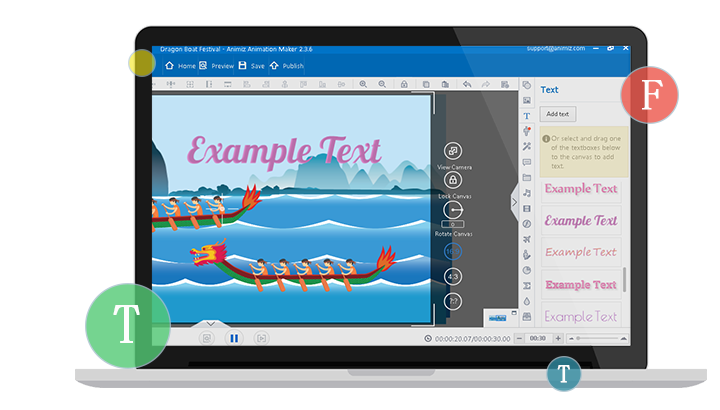 Publish interactive marketing videos to cloud. Animated videos will make you stand out online.